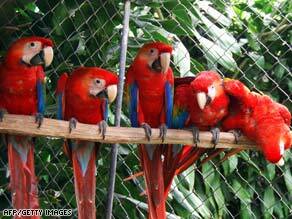 (above) A family of Scarlet macaws in Costa Rica in June 2008 at a zoo aimed at conserving the species. (CNN) -- Chilean inspectors stumbled upon hundreds of exotic animals from Peru destined for illegal trade while conducting what they thought was going to be a routine inspection of a fishing boat, the government said Tuesday. The Chilean boat, the Rosa Isabel, was carrying macaws, toucans, parrots, turtles, squirrels and crocodiles, most of them protected by the Convention on International Trade in Endangered Species of Wild Fauna and Flora, which prohibits the sale of these species, the government said in a statement. In all, officials counted more than 400 exotic animals from Peru, the statement said. The incident began before dawn, when inspectors from Chile's Maritime Administration boarded the boat and found the live cargo stuffed inside dozens of cardboard boxes lined with chicken wire and with holes cut on the sides for ventilation. The animals were handed over to the Farm and Cattle Service of Arica, Chile's northernmost city, for return to Peru, the minister of agriculture said Monday in a statement. The captain of the ship, Moises Segundo Diaz Verdugo, a Chilean national, faces a possible fine of between $188,000 and $940,000, to be determined by an Agriculture and Livestock Service (SAG) court. Under an agreement between SAG and the National Institute of Natural Resources of the Republic of Peru, signed in 2007, the animals will be returned to Peru, SAG said. The national director of SAG, Francisco Bahamonde, credited coordination among various state bodies with impeding the illegal entry of protected species and products that can transmit pests or illnesses and said they would "redouble" their efforts.